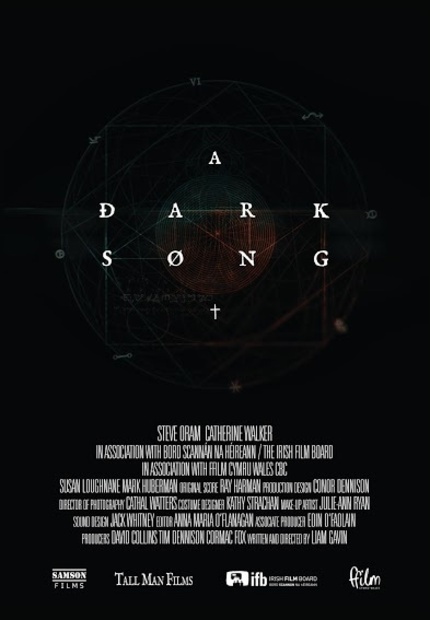 Writer-director Liam Gavin premieres his feature debut A Dark Song at the Galway Film Fleadh on Friday and producers have just released a first teaser to whet the appetite. Steve Oram (Sightseers) stars opposite Catherine Walker (Patrick's Day) in this story of a woman who hires an expert in the occult to guide her through a long and dangerous ritual. This first trailer is much more a mood piece than anything else - it's far more about impressions than it is about sharing plot points - but what a mood it is. This promises to be seriously dark and atmospheric stuff. Take a look below! A DARK SONG TEASER from David Collins on Vimeo. love the music for this. great imagery. showing a lot of promise. I'm intrigued. I do like horror movies where the characters call up the horrors of their own free will. Should be interesting to see their motives for the summoning. The trailer makes me think it's out of grief, but I'll try not to make too many assumptions.